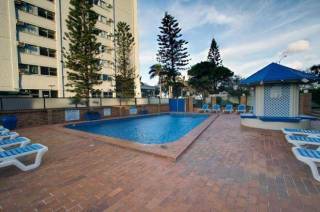 Contemporary, quality accommodation perfectly located close to beaches, theme parks and activities. Our luxury spacious apartments are self-contained with air conditioning, gourmet kitchen, laundry, large balcony, cable TV, heated pool, spa, sauna, BBQ, games room, gym & underground parking. A great apartment for 2-4 guests with a queen bed in the master bedroom and an ensuite for privacy. A double fold out bed in the study caters to extra guests with separate lounge and dining area for more living space. Need one night off? Modern & spacious One bedroom apartment for 2 guests. Close to trams, shopping, beach. Check our current specials... Extra Special- stay mid-week Mon to Thurs, and save 15% per night. Includes a queen bed in the ensuited master bedroom, a second bedroom with 2 single beds and a second bathroom. Spacious 2 bedroom apartment with queen bed in the master bedroom, ensuite, and 2 single beds in the second bedroom. Rates are for 4 people. Subject to availability Rates are for 4 people. The room caters for a maximum of 4 adults, and a maximum of 2 children but cannot exceed 5 guests in total. Spacious 3 bedroom apartment with queen bed in the master bedroom, ensuite, queen bed in the second bedroom, 2 single beds in the third bedroom and second bathroom. Stay a minimum 2 nights Enjoy a bottle of Trilogy Champagne on arrival. Conditions Apply. SAVE 50% off midweek stays. Events and school holidays surcharged. Subject to availability So close to Surfers Paradise so close to the Broadwater so close to the beaches. Your family or friends have room to spare in our spacious 3-bedrm apartments. Spacious high floor apartment with queen bed in the master bedroom, ensuite, queen bed in the second bedroom, 2 single beds in the third bedroom and second bathroom. Spacious high floor apartment with queen bed in the master bedroom, ensuite, queen bed in the second bedroom, 2 single beds in the third bedroom and second bathroom. Stay 3 or more nights and save. Spacious high floor apartment with queen bed in the master bedroom, ensuite, queen bed in the second bedroom, 2 single beds in the third bedroom and second bathroom. Stay a minimum 2 nights Events and school holidays surcharged. Subject to availability Extra-large luxury 3 bedroom apartments with large balconies and sea views, ducted air-conditioning and free parking Rates are for 6 people. The room caters for a maximum of 7people. Luxury 3 bedroom penthouse style apartment with views, large balconies for outdoor entertaining. Beautifully appointed gourmet kitchen, spa bath, study or media area. Fabulous for pre-wedding, corporate, or exclusive stays. Extra-large luxury 3 bedroom apartments with large balconies and sea views, ducted air-conditioning and free parking. Rates are for 6 people. The room caters for a maximum of 7. 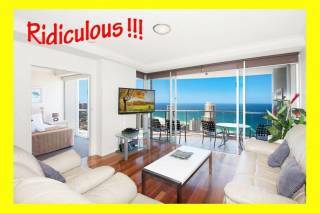 Luxury 3 bedroom penthouse style apartment with views, large balconies for outdoor entertaining. Beautifully appointed gourmet kitchen, spa bath, study or media area. Fabulous for pre-wedding, corporate, or exclusive stays. Extra-large luxury 3 bedroom apartments with large balconies and sea views, ducted air-conditioning and free parking. Rates are for 6 people. The room caters for a maximum of 7 people. Trilogy Surfers Paradise is a trio of sleek and contemporary holiday apartment blocks located close to tranquil Budds Beach and just moments from central Surfers Paradise. Relax in style in our spacious one, two and three bedroom luxury apartments Gold Coast, escape to the magnificent Gold Coast hinterland or laze your days away on Australia’s most loved beaches. 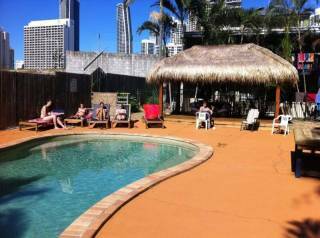 With outstanding facilities including a heated resort swimming pool, sauna, gym and spa, Trilogy Budds Beach accommodation features everything you need to unwind in the heart of the Gold Coast’s most sought after holiday destination. With wireless internet access in every apartment, keeping up to date with friends and colleagues is quick and easy. Ideal for corporate guests, these modern one bedroom, one bathroom Surfers Paradise luxury apartments feature a study area, fully equipped kitchen and separate laundry facilities. Apartments are air conditioned in living area and master bedrooms and feature wireless internet access, complimentary Pay TV and spacious balconies. Apartments feature one Queen Bed and one double fold-out bed and are suitable for a maximum of Four guests (additional charge for rollaway bed). Within 14 days or No Show - Full amount forfeited. Within 30 days or No Show - Full amount forfeited.